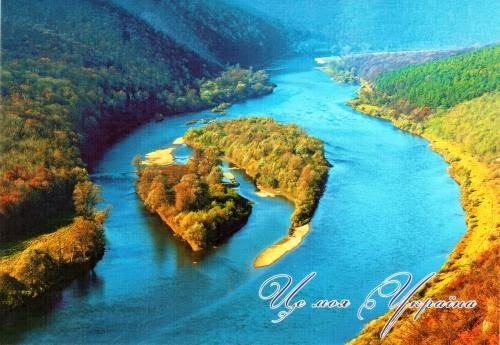 Postcard UA-951602 from Ukraine shows Dniester Canyon, a 250-km or 155-mile river segment of the Dniester River from the mouth of Zolota Lypa River to the mouth of Zbruch River. According to Wikipedia, Dniester River is the second largest and the most ecologically clean river in Ukraine. Similar to the Colorado River below the Glen Canyon Dam in the United States, Dniester Canyon is partly flooded by reservoir waters. While the water depth can reach up to 50 meters, the canyon valley has its depth varied from 80 to 200 m or from 260 to 650 ft. Its original and unique geological, botanical, archaeological, and hydrological nature earned its reputation as one of seven natural wonders in Ukraine. Dniester Canyon was recognized the National Nature Park on February 3, 2010. How Many Days Until Next Holiday?